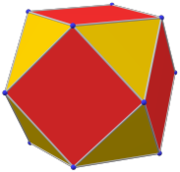 In geometry, a pentagonal icositetrahedron or pentagonal icosikaitetrahedron is a Catalan solid which is the dual of the snub cube. In crystallography it is also called a gyroid. It has two distinct forms, which are mirror images (or "enantiomorphs") of each other. The pentagonal icositetrahedron can be constructed from a snub cube without taking the dual. The 6 square faces of the snub cube are kised to a height that the new triangles are coplanar with the triangles, and tetrahedra (not necessarily regular tetrahedra) are added to the 8 triangular faces that do not share an edge with a square to a height that the new triangles of the raised tetrahedra become coplanar to the triangles which do share an edge with a square. The result is the pentagonal icositetrahedron. Denote the tribonacci constant by t, approximately 1.8393. (See snub cube for a geometric explanation of the tribonacci constant.) Then the pentagonal faces have four angles of cos−1 (1 − t/2) ≈ 114.8° and one angle of cos−1 (2 − t) ≈ 80.75°. The pentagon has three short edges of unit length each, and two long edges of length t + 1/2 ≈ 1.42. The acute angle is between the two long edges. 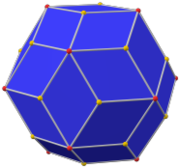 The pentagonal icositetrahedron has three symmetry positions, two centered on vertices, and one on midedge. Isohedral variations with the same chiral octahedral symmetry can be constructed with pentagonal faces having 3 edge lengths. This variation shown can be constructed by adding pyramids to 6 square faces and 8 triangular faces of a snub cube such that the new triangular faces with 3 coplanar triangles merged into identical pentagon faces. This polyhedron is topologically related as a part of sequence of polyhedra and tilings of pentagons with face configurations (V3.3.3.3.n). (The sequence progresses into tilings the hyperbolic plane to any n.) These face-transitive figures have (n32) rotational symmetry. The pentagonal icositetrahedron is second in a series of dual snub polyhedra and tilings with face configuration V3.3.4.3.n. 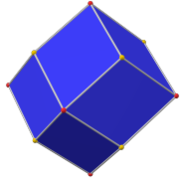 The pentagonal icositetrahedron is one of a family of duals to the uniform polyhedra related to the cube and regular octahedron. 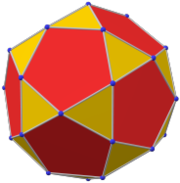 ^ Eric W. Weisstein, Pentagonal icositetrahedron (Catalan solid) at MathWorld. Degenerate polyhedra are in italics. This page was last edited on 20 December 2018, at 20:58 (UTC).